Is MasterCard Getting the Best of Its Big Brother Visa? In recent years, Mastercard has introduced a series of innovative new features and products to its payment network that are already boosting the bottom line. Is Visa keeping up? It would be difficult to find a pair of stocks investors would have been better off owning over the past decade than the payment network duopoly of Mastercard Inc (NYSE:MA) and Visa Inc (NYSE:V). Both stocks have produced phenomenal returns for investors since going public. Since March 2008, Mastercard has returned 481%, and Visa has risen 570%. This compares to the S&P 500's meager-by-comparison 75% overall gains over the same period. 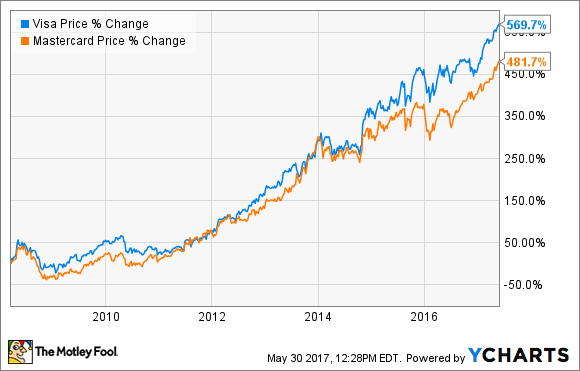 In addition to sharing almost identical gains over almost a decade in trading, the two companies share almost identical business models as well. In the 2016 BrandZ Survey of Top 100 Global Brands, Visa is said to have the world's sixth most valuable brand; Mastercard ranks 20th. According to the Nilson Report, Visa facilitated 139 billion transactions worldwide in 2016, representing 54% of the total number of card transactions. Mastercard negotiated 67.3 billion card transactions, good for 26% of global volume. In most consumers' minds, the two companies are largely interchangeable, with both sporting high levels of awareness and trust. And that's how I had always thought of the two companies; that both offered nearly identical services for nearly identical prices. Lately, though, I've begun to wonder: Has Mastercard surpassed Visa as the premier payment network? No, I don't mean in size. Visa is unquestionably the larger of the two but, rather, in terms of services and capabilities that Mastercard can offer its different customers such as financial institutions, merchants, and consumers. Spoiler alert: It is undoubtedly too early to tell, yet here is my case for why I believe Mastercard might be on its way to outclassing Visa. In the past couple of years, Mastercard has introduced a number of innovative security products and features that enhance payment convenience. In 2016, Mastercard introduced its Mastercard Identity Check in diffrent markets around the world. Popularly known as "Selfie Pay," the program allows account holders to opt into the program that requires users to take a picture of themselves to authenticate "card not present" transactions. Later in 2016, Mastercard followed "Selfie Pay" up by launching a new AI-powered security platform, Decision Intelligence, a service that "uses artificial intelligence technology to help financial institutions increase the accuracy of real-time approvals of genuine transactions and reduce false declines." Earlier this year, Mastercard acquired NuData Security, a company that uses passive biometrics to prevent fraudulent transactions. The company claims its products can authenticate purchases by intimately knowing consumers' digital profiles, which includes things like the way they type on their keyboards or even how they hold their smartphones. A month later, Mastercard announced it would be introducing a card with a fingerprint scan on the card itself. Banga said the card had recently finished successful trials in South Africa and would soon be given more test runs in markets across Asia and Europe. I just think the opportunity to be able to go to any customer in the world and both the bank and a merchant and even a consumer eventually, and show them... from a MasterCard card to using Mastercard Send for P2P to using ACH capability. As we get the capability from VocaLink embedded across our system and as we can do it at different levels of complexity in different countries. Making things easier for investors, Mastercard reports the revenue it earns from its security, data analytics, and loyalty program management services, into what it unceremoniously refers to as its "Other Revenues". For several quarters, this was Mastercard's fastest-growing revenue segment, routinely growing by more than 20% over the previous year's corresponding quarter. In its recently reported first quarter, this changed due to some recategorizing of loyalty service revenue in Asia, so it "only" reported $561 million in revenue, a "mere" 13% increase year over year. On an apples-to-apples basis, the increase would have been an even more robust 18%. Visa, however, does not separately break out its revenue streams in this manner, so it is more difficult to tell how much money it makes by selling comparable services. VocaLink, look, somebody would have to ask MasterCard what their logic is and how they feel about it and what their game plan is? Our view is that we have a perfectly terrific answer to VocaLink, which is something we call Visa Direct. We have direct connections to the banks around the world ... and by the way, Visa Direct is global, whereas most ACH solutions, including VocaLink is domestic. There's no reason why they ultimately probably can't package it in such a way and offer it domestically in other markets. But it is -- today, it's a U.K. domestic solution. So we're not really plussed by it. I think that we feel like we've got a good answer in Visa Direct. Of course, Mastercard is planning to package VocaLink's ACH capabilities in markets around the world. And while, yes, Visa Direct, does offer the same capabilities as ACH payments, the simple fact is that it doesn't seem to have made a major dent in ACH volume. Neither is it used very much for the types of transactions that ACH is known for, like payroll and direct deposits. In 2015, the National Automated Clearing House Association (NACHA) reported that ACH networks moved $41 trillion dollars over 24 billion electronic transactions. Immediately after Mastercard acquired VocaLink, Banga stated ACH transactions accounted for about half of all payment volume in the world's fifty most developed countries. I would say that I've learned not to agree with that. We -- as I've gone around and met with all of these financial service partners, not once has somebody said to me, you've got an issue, your services are not sufficient or inferior to MasterCard. We believe we offer virtually the same types of services to all of our customers. We sometimes charge for them, sometimes we don't, sometimes they're built into the deal, sometimes they are not. But across our 4 primary revenue lines in our P&L is an awful lot of services, we provide help to financial institutions in terms of Advertising Solutions, Loyalty Solutions, Offers Platforms, Reward Redemption Platforms. We offer a whole bunch of data and analytics and consulting types of services. We offer all kinds of fraud and risk services. And then we offer all kinds of digital services in terms of tokenization, Visa Checkout, Visa Direct, which I was just talking about. And in many cases -- or in some cases, we're paid for those. In other cases, our philosophy is to provide them to our partners and if it helps them grow their business, ours will grow in tandem with them. So while it has tended to be broken out and made a big deal of by MasterCard, I think I'm very comfortable with where we are. This is a much tougher statement to analyze. Since Visa doesn't break out its revenues in the same way, it's impossible to know what kind of revenue Visa's comparable services generate. Nothing in Visa's numbers indicates it is struggling to grow. Quite the opposite: In Visa's most recently reported quarter the company reported revenue of $4.5 billion, a 23% increase year over year, and adjusted earnings of $0.86, a 21% increase. It's also not like Visa has done nothing on this front: Just last December, Visa acquired the digital commerce security firm, CardinalCommerce. Most importantly, not one major bank or financial institution has left the Visa umbrella for any reason in recent years, much less for reasons of insufficient services. Investors already invested in Mastercard or Visa, should do nothing. Both companies sport superior business models, allowing them to make money on card transactions without taking on any credit risk. The ultimate losers in this arms race might very well be American Express Company (NYSE: AXP) and Discover Financial Services (NYSE: DFS), not Visa. Mastercard investors, might want to consider adding more to their position. The money they are generating from these bundled services is providing a serious "oomph" to its earnings. Visa investors should continue to follow the company's earnings and look for signs the business might be starting to lag its biggest rival. More importantly, shareholders should browse through company headlines to see if banks or other financial institutions jump ship to Mastercard. Investors in both companies have enjoyed superior returns for years, and there is little evidence that that will stop anytime soon.